I have an interesting relationship with Arthurian legend. As it happens, I’ve read many of the older stories and more modern re-tellings, memorized passages for school recitation, and watched numerous movie adaptations. I’m rather familiar with the general story, as it were. I’ve found very few of these depictions end with any sort of hope. Most end with the death of Arthur – Camelot fades to black, roll credits. The characters are compelling, but for a reader who is mainly interested in stories of redemption, Arthur doesn’t quite fit the bill, even as he has made up a large part of my literary life. All to say, this book is a first for me – to see beyond the final battles and betrayals, and what could have been the rest of the story. And I love it. 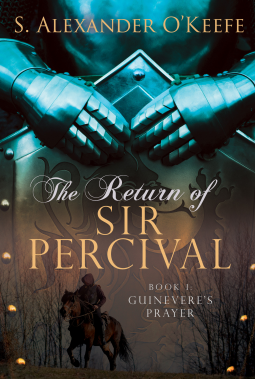 The new spin on Guinevere, Merlin, Morgana, Percival and the Knights, even Arthur himself, is amazing. We step down out of legend and into story. This is the book I wish I would have read before all the others, as it brings the tale to life in a way no other author has for me. Mr. O’Keefe’s writing is superb. His richness of language, and skill in timing the plot make for a work I will hold up as an example for other writers to follow. I could continue in my praise, but that is time that you’re not reading this book! Be sure to get a copy!